The Roman leaders look favorably upon you; now is your chance to earn the bountiful riches of the Empire! Click here to play! Become a Roman great from bygone days and return a wealthy winner. 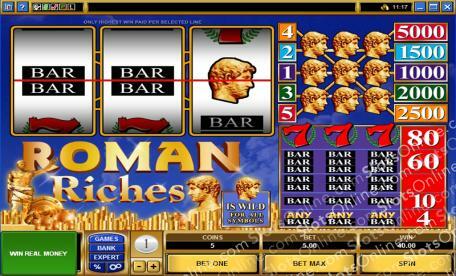 Roman Riches is an impressively traditional slot machine played across 3 reels and 5 pay lines, where the more pay lines opened means greater chances for winning combinations! The Roman Head is Wild and can be substituted for any other symbol on the reels in order to complete lucrative winning combinations. Bars and 7s are also great symbols to get three-of-a-kind on, but the Roman Heads reign supreme, with payouts of up to 5000 times your original wager when three of them appear on the fifth pay line. The Roman Empire may have fallen, but its riches are still vast and bountiful. Earn you piece of it today at Roman Riches! The Roman Head is Wild and can be substituted for any other symbol of the reels. Payouts up to 5000 coins are on offer.